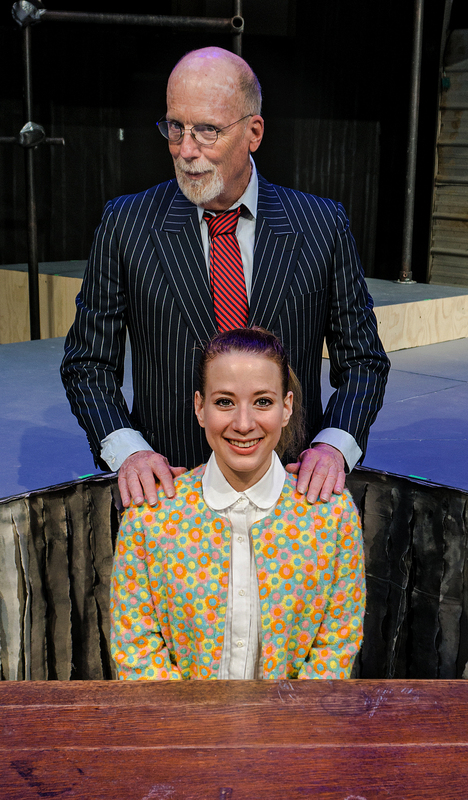 The hilarious satire URINETOWN – the musical, continues LNT's Blockbuster 30th Season at Montpelier City Hall Arts Center. Thanks to John Snell, photographer for the pics on this page! It’s the Best Musical with the Worst Title! 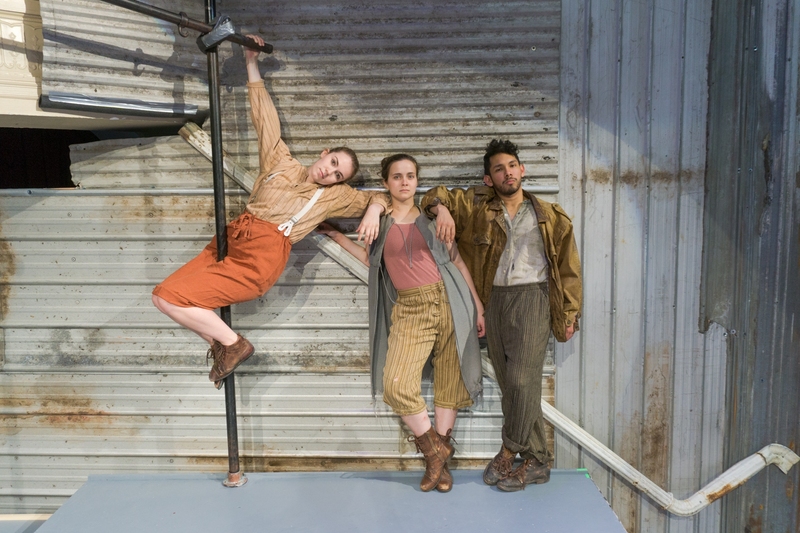 Urinetown – that multiple Tony Award, Obie Award and Critics Circle Award-Winning musical by Mark Hollmann & Greg Kotis, takes the stage Thursdays thru Sundays, May 31 thru June 17. Urinetown is a hilarious musical satire on capitalism, populism, politics, people, and musical theatre itself! The clever writers pay homage to such theatrical giants as West Side Story, Les Mis, Chicago, Oklahoma, Three Penny Opera, Cabaret, The Cradle Will Rock, Fiddler on the Roof, Guys & Dolls and so many more – without losing a beat of originality! Add a dose of Monty Python (or South Park) and you are in the right neighborhood for Urinetown! The show imaginesa world in the grip of a 20-year drought. Reservoirs have all dried up. And it’s become a “Privilege to Pee” (a tune in the show!) as a powerful private corporation - the UGC (Urine Good Company) has gained control over all water rights and “water-closet” use. Headed by the evil Caldwell B Cladwell, UGC maintains its control by bribing police & politicians to do its bidding. Private bathrooms are outlawed. Public Amenities are franchised with steep fees. And there are severe consequences for going in the bushes! It doesn’t sound possible, but this show is Laugh Out Loud (piss your pants) Funny. Leading you through the adventure – complete with heroes, star-crossed lovers, evil villains, heartache & hilarity – is Officer Lockstock, along with his sidekicks Officer Barrell and the precocious Little Sally. Bringing this bodacious Broadway musical to life at Lost Nation Theater is an ensemble that features artists well-known to LNT audiences and triple-threats new to the company. Tim Tavcar returns to portray Cladwell, a role director Sarah Jane Schostack proclaimed he’d “clearly been preparing for his whole life” after the first read-through. Ms. Schostack (an associate director at Lincoln Center in NYC) returns having directed Mary Poppins last summer. Mark Howard Hanson (Always Patsy Cline) returns to lead the marvelous diverse music of Urinetown. Also returning on-stage are Hannah Roberts Brown (Hairspray, To Kill a Mockingbird) Taryn Noelle (Hairspray), Kathleen Keenan (Always Patsy Cline), William Pelton (Hairspray, Into the Woods) Rick Ames (Hairspray, Silent Sky) and Nick Wheeler (The Baker, Into The Woods). They’re joined by talented actor-singer-dancers from Boston, NYC, Miami and California including JP Coletta, Jessie del Rio, Jordy Diaz, Madisen Johnson, Eric Miller, Sarah Milnamow, Jennifer Sassaman. Lost Nation Theater is excited to introduce these high-octane artists to Vermont! We’re also excited to introduce award-winning choreographer Stephen Dean Moore to Vermont. Moore’s work has been seen at Glimmerglass, on MTV and London’s West End. Urinetown is a favorite show of his (LNT’s production will be his third). Also joining Lost Nation Theater for Urinetown are lighting designer Thomas Gunn, international costume designer Johanna Pan, scenic designer Lindsay Fuori, and stage managers Ashley Zoglman, Chelsea Taylor and AJ Bierschwal. Schostack, Moore and the entire ensemble promise a song & dance extravaganza complete with everything from the silliest of sight-gags and “oh-no-they-didn’t” props, to the most profound thoughtful provocation. 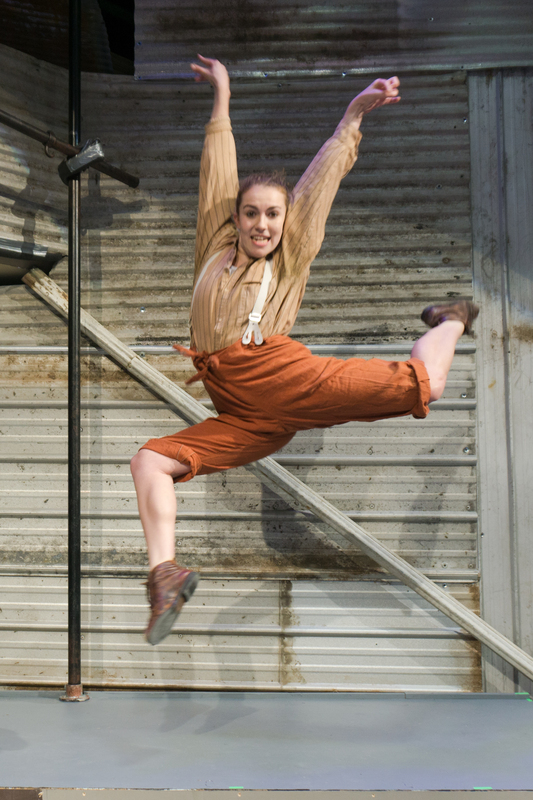 Urinetown turns things upside down. Those greedy evil villains aren’t necessarily all wrong about resources. The rebels fighting for justice, may not always be right. "Riotous & Infections.” —Variety “An Audacious Outrageous Fable” – NY Times. See it. Show Duration: Thursdays­–Sundays, May 31 - June 17. Curtain is 7:30pm Thu, Fri & Sat; 2pm Sat & Sun. Show Pricing: $10 - $35 Students & seniors (age 65): $5 Off. Youth (11 and under) $15 Fri/Sat Eve’s $10 Thu & Matinees. Click Here, Call 802-229-0492 or get tickets at the City Clerk’s Office on the first floor of Montpelier City Hall. You can also take a chance at the door (starting 1 hour before curtain).